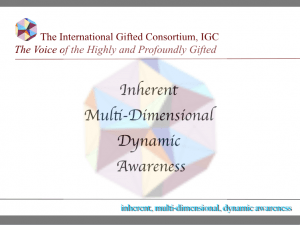 Social, Emotional, Physical, Cognitive and Altruistic components of Giftedness can be masked, overlooked or misunderstood. Many are misidentified and misdiagnosed. 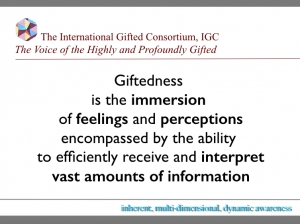 While Giftedness generally includes academic intelligence, when we narrow our view of Giftedness to Academic Achievement alone, we miss the very essence of Giftedness. 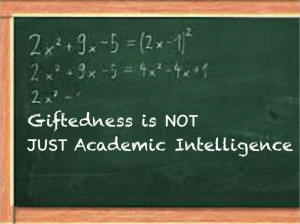 IQ scores don’t measure, the social, emotional, physical, altruistic components of Giftedness or the acute awareness. 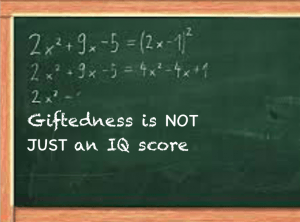 An IQ score only attempts to measure, the cognitive component of Giftedness. How a child feels that day, their mood, how they feel in the environment, how they respond to the examiner, are all variables that effect the quantitative results. 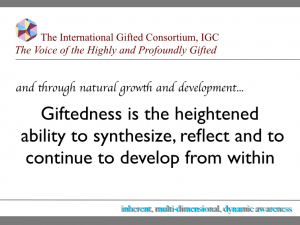 Appropriate metrics that measure and identify the core of Giftedness are essential. A different wiring or awareness. 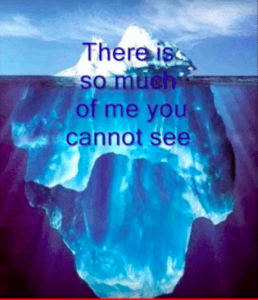 A different way of operating or perceiving or taking-in and interpreting information. 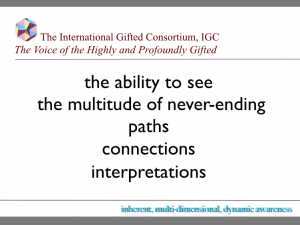 Giftedness is a different way of seeing, perceiving and experiencing the world.